I didn’t take the kids to see the BRAVE movie when it came out in the theater, I really didn’t think my five-year-old would like it. But we watched it last night and boy was I wrong. It seems like it would be more of a “girlie” movie, but it really isn’t. There is definitely enough to keep the boys interested: 3 terrible but funny triplets, archery, Scottish clans battling for the right to marry, Kings and Queens, a witch, and bears! My son laughed so hard at several parts, I was laughing at him laughing! I love the time period and the scenery, even though it was animated. But don’t stop at the movie, the discs are filled with so many cool bonus material, it will keep them occupied for quite awhile! 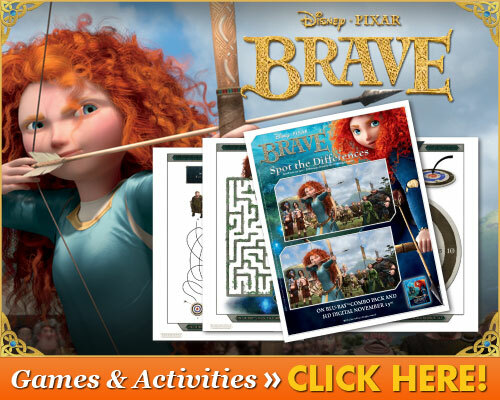 In creating the story for “Brave,” the filmmakers took elements of Scottish history and lore to construct their own legends. A demon bear named Mor’du, the gathering and unity of the clans, the role of the mystical will o’ the wisps and a mysterious witch with the power to create change are all rooted in reality and mythology. An original and thrilling journey set in the ancient and magical Highlands of Scotland, “Brave” follows the heroic journey of the headstrong, young adventurer Merida. Determined to carve her own path in life, Merida confronts tradition and defies an age-old custom that inadvertently unleashes chaos, and forces her to discover the true meaning of bravery. Brave voice actor, Kevin McKidd (from TV’s Grey’s Anatomy), shares his family’s recipe for traditional Scottish skirly! Why not bring some Scottish flavor to your table this weekend and add the swagger that comes with knowing the native lingo with the below recipes and Scottish dictionary! Crivens, you’re fierce! With the release of Disney Pixar’s BRAVE, PSIMadeThis.com’s Erica Domesek tackles tartan, one of the biggest trends on the runway this season and demonstrates how you can incorporate it into your wardrobe with an easy DIY fashion project. Get inspired by spunky princess Merida and go mad for plaid with this fun and easy project! To celebrate this week’s release of the Brave Blu-ray combo pack, Disney / Pixar teamed up with butter LONDON to create a custom nail bar with Scottish Tartan nail art designs inspired by and as seen in the movie, Brave. Katie Hughes, butter LONDON’s Global Color Ambassador designed the custom tartan-inspired nail design. Are you Brave enough to give this trend a try? HOW TO: Paint two coats of butter LONDON’s Nail Foundation Flawless Basecoat for a beautiful, natural looking nail. Paint a brush-width strip of butter LONDON’s Queen Vic down the outside part of your nail. With a thin, long nail art brush, paint a thin line of butter LONDON’s Stag Do down each side of Queen Vic. With the same brush and color, paint two small horizontal lines below the cuticle (try to keep the lines from going as low as the middle of the nail). Clean the brush in some acetone or nail lacquer remover and paint two horizontal lines of butter LONDON’s Sprog at the tip of the nail, as well as one vertical line down the right side of the nail. Apply butter LONDON’s Matte Finish Topcoat, and you’re good to go! · “La Luna” Theatrical Short – Fans will love this charming short that accompanied the film in theaters. It follows a young boy on his first night working the family business alongside his father and grandfather. · “The Legend of Mor’du” Short – This rousing new bonus short film will give fans the chance to delve deeper into the legend behind Mordu, as told by the eccentric witch who transformed him. · Brave Old World – Fans will watch as members of the “Brave” production team investigate Scotland, exploring its land, culture, people, and dialects. The research they gathered was brought thrillingly to life in the film. Also, fans will hear what actress Emma Thompson (voice of Queen Elinor) thinks of Pixar’s take on her homeland. · Merida & Elinor – With the creation of Merida and Elinor, the Pixar filmmakers delved deep into the relationship between mother and daughter. Highlighting contrasts in character design, clothing, animation, voicing, even hairstyle, watch how the filmmakers explored this most important of relationships. · Bears – Take a look inside the art and design behind the bears in “Brave.” Each of the bears, gentle Mum-Bear and terrifying Mor’du, demanded a different approach to creating their physical appearance and personality. · Brawl in the Hall – A fascinating and hilarious inside look at the process of creating “Brave’s” fighting Scots, through animation, crowd simulation and fight choreography – not to mention a room full of grunting men whose vocal chortles added authenticity to the raucous scene. · Wonder Moss – Fans will explore how “Brave’s” technical artists examined the real Scottish countryside and studied the laws of nature, then turned these findings into computer codes that would blanket Merida’s Scotland in lush moss, lichen and bracken. · Once Upon A Scene – A closer look at the evolution of the storylines throughout the production of the film, including alternative openings to the film and many deleted scenes. · Extended Scenes – Three separate scenes are highlighted in their extended form. Director Mark Andrews discusses the decision-making process that led to the shortened versions of these scenes. · “Fergus & Mor’du” An Alternate Opening – Once upon a time, “Brave” had a different opening scene. Eventually cut from the film, fans can see it in its entirety in this bonus feature narrated by the film’s director Mark Andrews. · Fallen Warriors Montage – A selection of deleted shots that were cut from the film late in production are presented to fans in various stages of completion through a video montage narrated by director Mark Andrews. · Dirty Hairy People – Fans will enjoy this uproarious bonus feature discussing the development of “Brave’s” Scots – including the design of their hair, attire, and dirt-crusted physiques. · It is English…Sort Of – This bonus feature helps fans interpret some of the more Scottish lines in the film, thanks to the real Scottish actors who play the key characters and contributed their own dialects and sayings. · Angus – A look at Merida’s most trusted companion, Angus, a mighty Clydesdale. · The Tapestry – Fans will learn the story behind this embroidered emblem of family unity, which was lovingly crafted by “Brave’s” team of artists. 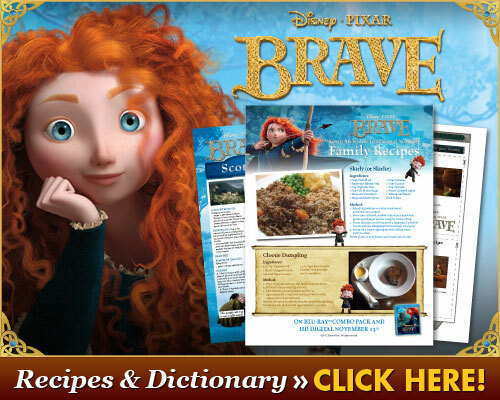 · Promotional Pieces – This bonus includes promotional clips for “Brave,” including: “Feast Yer Eyes,” “Relics,” “Clan DunBroch,” “Launch,” and more. · Art Gallery – A selection of breathtaking art from the creation of the film, showcasing characters, sets, scenes and stunning landscapes. · Wee Gaffes – A video montage of simulation, animation and shot bloopers. · Renaissance Animation Man – Get a look at Director Mark Andrews’ love of Scotland, sword-fighting, music and more! Diary of a Wimpy Kid: Dog Days DVD & Our Exclusive Interview With Jeff Kinney! i wasn’t as happy with the story on this one, as I was with some of the other Disney/Pixar movies. It did seem a bit “dark” compared to the normal Disney movies, but my son really enjoyed it. 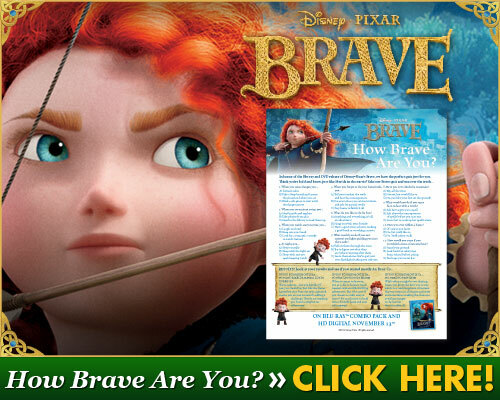 I didn’t get a chance to go see Brave when it was in the theater, but will definitely catch it on DVD. I appreciate the fact that there are activity sheets that accompany the movie, so the children can relive the fun they have watching the movie. Thanks for the review.